It’s beginning. Fall is here, and leaves are changing into their autumn beauty. You come out to your car in the morning and there are a few leaves on your windshield. But before you know it, it will look like the trees are dropping leaves by the ton. Leaves covering your yard should be picked up throughout the fall so they don’t damage your yard, since the grass underneath is making its last ditch effort to build up nutrients and strengthen their roots before going dormant for the winter. But just as important as picking up leaves from your yard is cleaning the leaves from your gutters. 1. Ladder safety – The biggest reason to avoid cleaning your gutters is the lack of safety when climbing up on a ladder. The U.S. Consumer Products Safety Commission says about 165,000 Americans are injured from ladder-related accidents, with 90,000 of them needing emergency room treatment. Being up on a ladder to clean out your gutters puts you at risk for a fall, especially if the ladder is placed on uneven ground where it could fall out from under you. 2. 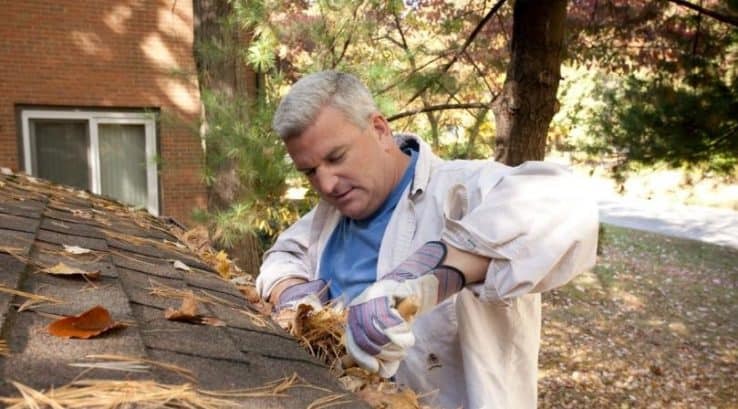 Going solo – While some homeowners may attempt to clean their gutters themselves, one big mistake is to not have a helper with you. The most important reason is to have your helper keep the ladder steady at all times. Even if you’re using a step ladder, it’s important to have a helper steady it. They can also assist by handing you tools and other items you might need while cleaning your gutters. 3. Insects/mold spores – You never know what could be hanging out in your gutters. Lots of critters like dark, damp, or remote places like a gutter, including birds, rodents, bees, and other insects. Decaying leaf matter can also contain mold spores or other bacteria that could pose a health risk if you inhale it. 4. Power lines – You may have power lines running into your home from the street. If your ladder comes in contact with a power line, there’s a real risk of electrocution. There may be other wires running into your home, such as cable and telephone, that could be damaged when you’re up on the ladder. 5. Damage to your home – Since homeowners typically clean gutters in the spring and fall, it’s not a common task like mowing the lawn. If you’re inexperienced, you risk denting the gutters from the way you position the ladder. Depending on what types of tools you use and the condition of your gutters, you risk separating seams between gutters or gouging a hole, causing gutter leaks and potential costly damage to your foundation. For many homeowners, the risks of gutter maintenance outweigh the rewards. But it’s still critical to keep your gutters clear and free-flowing, otherwise you risk damage to your fascia, soffit, foundation, and landscaping caused by overflowing or clogged gutters. There are two solutions. You can hire a professional gutter cleaning company to clean out and inspect your gutters. They do this for a living, day in and day out, know the risks, and know the best and safest way to de-clog your gutters. Your other option is to install a clog-free gutter system, like the ones available from Thompson Creek. Because the gutter is designed with a hood that filters out leaves to prevent clogging, they eliminate the need for fall gutter cleaning. The only thing that can make its way into your gutters is rain water, which flows easily through the gutters to the downspouts and away from your home. Thank you for mentioning that you can get upgrade the lock on the sliding door to up security. We’ve been having problems with our lock right now and have been meaning to get it repaired. We’ll definitely look into both of these options, but this has been really enlightening. Thank you! I think that you’re right that it’s not the worst case scenario to replace your windows in the winter. I think that it’s wise to remove one window at a time and make sure you have a great professional to avoid problems. I should maybe replace my cracked window sooner than later.